DECEMBER CAN BE A CHALLENGING MONTH for many reasons – it is a time when we are ready to wind-down after a full year of challenges & commitments and yet work, home-life and the responsibilities of the festive season often demand even more from us. In this blog we offer some ideas and actions you can implement as part of a wellbeing plan for this eventful month. For many of us – this time of year is full of duty and obligation and many things are done by rote. A big part of creating a more conscious pathway to wellbeing is to contemplate what is going to serve you – energetically, financially, emotionally and spiritually. Re-enliven some of the more habitual and conventional approaches you have and take some time to really think about what you want to manifest over the Christmas period. It may be you decide to attend just one social gathering instead of three, or that joining the shopping frenzy is too stressful so instead you choose to write a heartfelt card to each person. It can take courage to step outside of a conventional approach and away from what may be expected of you, but this is what wellbeing is all about. Create a space where you can contemplate what you really want to engage in and consciously decide your approach. Many crazy thoughts can happen at this time of year – due to old triggers, expectations, tiredness and stress – making it harder to be the master of our thoughts and actions. On all our Alamandria workshops and retreats we cultivate ‘focussed attention’ and positivity. A great way to do this is to write an appreciation list each day – of everything you love, appreciate and are grateful for. You may repeat many of the same things everyday – but the important things is to cultivate the feeling of positivity as you write. This can change your energy and create positive momentum – attracting more positive interactions and opportunities throughout the day. Buy a notebook and pen and keep it by your bed to do first thing in the morning. Starting and/or ending the day with a meditation, breathing exercise or a quiet walk by the ocean can set you up for the day or for a good night’s sleep. These practices can provide inner nourishment and cultivate a calm disposition. Connecting inwardly through meditation or nature is also a wonderful antidote to the consumerism, media and frenetic energy that we come into contact with at this time of year – allowing us to experience a slower pace and a greater sense of objectivity. Schedule 20 minutes as part of your daily inner practice. Christmas has become a time synonymous with overindulgence. As we become more in tune with our own health and wellbeing we may prefer to change our usual approach and choose something that will best serve our body, mind & soul. You may decide to go alcohol free for the season, or create a healthy balance by going for a bike ride or walk every morning. Mix it up – and start a Christmas Wellbeing Resolution of your own that is going to serve you and your goal of creating a season of health. Visualise how you want to feel over this time and decide on what resolution you could integrate to manifest this. As the weather heats up, as well as our activity, even very obvious things like keeping hydrated can be overlooked. Drinking water throughout the day is very important – it helps keep you clear headed, healthy and alert. Keep a bottle of filtered water with you at home, in the office and in your bag. Water can have psychological restorative effects too – swimming or having a shower can help cleanse away a stressful day. At Alamandria we see Christmastide as an opportunity to live into the essence of what Christmas truly is – a time of renewal and deep inner reflection. For us, contemplating and meditating on themes that can help facilitate personal change and transformation over the year ahead is something we focus on over the Twelve Holy Nights which start on the 24 December. 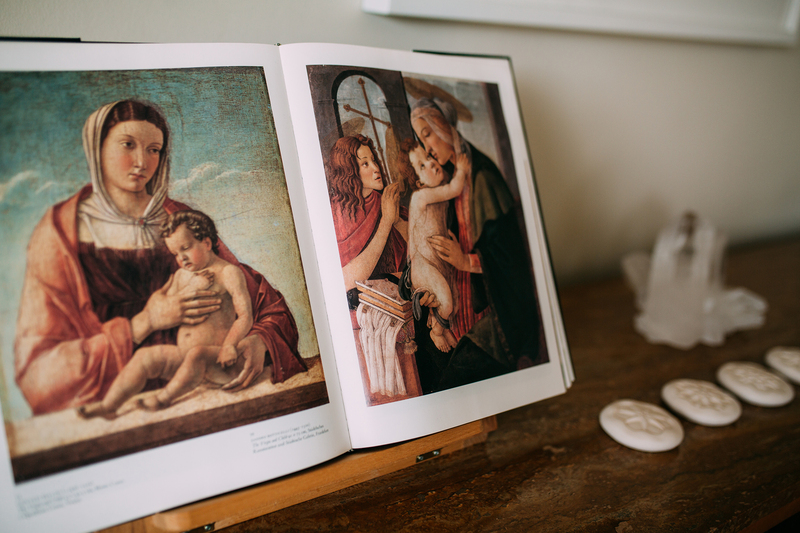 Mark and Emily have worked with the indications that Rudolf Steiner gave to Herbert Hahn – a daily contemplative guide for each night – for many years now. If you feel like taking a deeper and more contemplative approach click on the link below for the pdf. Catherine our Alamandria yoga practitioner will be sharing a yoga asana every month. Chosen because this pose assists to boost energy in the body and release tension in the shoulders and upper back. Kneel on the floor, big toes touching, knees a little wider than hip distance apart and carefully sit back onto your heels. 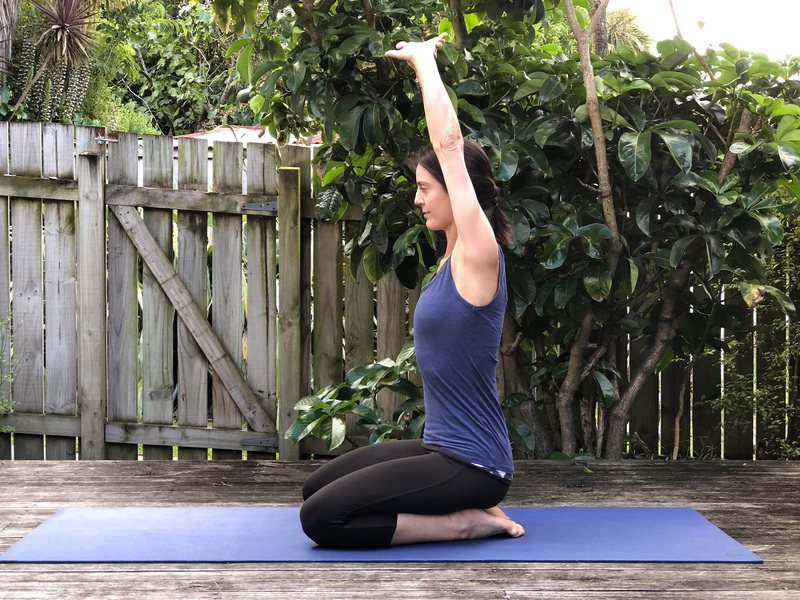 Keeping your spine straight, interlace the fingers, rotate the palms away from the body, extend the arms forward then raise them in the direction above the head, palms will now be facing up. Try to keep the arms as straight as possible. Stretch your arms towards the ceiling/sky, being aware of keeping your lower ribs in and not bending from the lower back. Do not lift you arms beyond the point where you find you are no longer able to maintain a balanced front and back body. Take a few even breaths to release any tension in the body and keep your face/jaw relaxed. Slowly lower the arms. Change the interlace of the fingers, and repeat. CAUTION: If you have injured knees, you can do this while sitting up straight in a chair, or even standing.